Les organistes Baoer Fu (conservatoire central de Pékin) et Alexander Meszler (université d'Arizona) se partagent un concert et reflètent deux écoles d'orgue venues de deux continents. Venez découvrir ces jeunes talents! 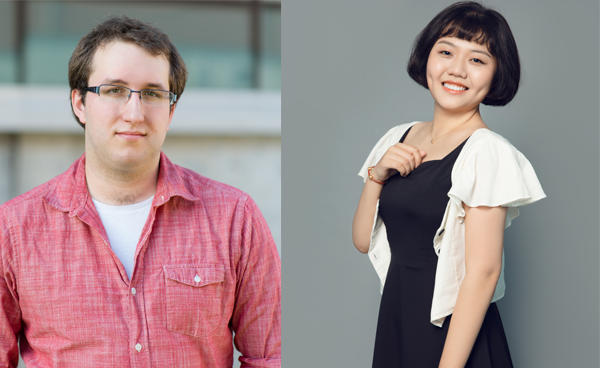 / Young talent concerts with Baoer Fu (Beiijing Central Conservatory) and Alexander Meszler (Arizona University). Both will share a concert and show two different traditions of organ performances. This program will be also given in concert in Lévis-Saint-Nom church on Friday December 14 at 8:30pm More informations here : http:// - association Éclats d’orgue à Lévis-Saint-Nom. Dieu Parmi nous, extrait de la Nativité du Seigneur. Alexander Meszler est un organiste américain qui a étudié l'orgue à l'Université de Syracuse (New York) où il obtient un Bachelor dans la classe de Kola Owolabi puis à l'Université du Kansas où il obtient un Master dans la classe d'orgue de Michael Bauer et James Higdon. Baoer Fu est étudiante en Master avec Yuan Shen au Conservatoire Central de Musique de Pékin en Chine où elle a déjà obtenu une Licence. En 2014, elle participe à l'International Organ Music Festival de Groningen et elle est sélectionné au Young performer concert. La même année elle est sélectionnée au “Youth Talent Project” à Haarlem pendant l'International Organ Music Festival. Elle reçoit des Master classes d'organistes comme Leo van Doeselaar (Holland), Wlogang Zerer (German), Oliver Latry (France), Jean-Baptiste Robin (France), Lorenz Geilmi (Italie), Pier Damiano Peretti（Italie)，Isabelle Demer (Canada)，Hans-Ola Ericsson（Suède), etc. En 2017, elle remporte le premier prix "Haarlem-Central Conservatory Scholarship" Competition et elle est invitée au Haarlem international organ festival pour étudier durant l'été 2018. Baoer Fu is a Chinese organist, currently Master student of organ study with Professor Yuan Shen in the Central Conservatory of Music (Pekin, China). In the same conservatory she finished her bachlor studies. During college，she has participated in the Beijing International Organ and Electronic Organ Music Festival three times.In 2014，she participated in the International Organ Music Festival in Grolingen and Selected as an excellent young performer concert.In the same year，she was selected as the “Youth Talent Project” at the Harlem International Organ Music Festival in the Netherlands. She received master class from great professors, such as Leo van Doeselaar (Holland), Wlogang Zerer (German), Oliver Latry (French ), Jean-Baptiste Robin (French), Lorenz Geilmi (Italian), Pier Damiano Peretti（Italian，Isabelle Demer (Canada)，Hans-Ola Ericsson（Sweden), etc. In 2017, she won the first prize in the "Haarlem-Central Conservatory Scholarship" Competition and invited by Haarlem international organ festival to study with full scholarship in July 2018. In 2018, she won the first prize in the "Versailles Young Organist Competition". Alexander Meszler is a Phoenix-based organist from upstate New York. Concerned with the future of the organ in an increasingly secular society, he dedicates himself to a wide range of research and performance addressing this issue. In October 2018, he will travel to France on a Fulbright award to investigate secularism and the organ and to study with Jean-Baptiste Robin at the Conservatoire à Rayonnement Régional de Versailles. He is perusing a Doctor of Musical Arts at Arizona State University with Kimberly Marshall. A strong advocate of music by living composers, he currently serves as a member of the national American Guild of Organists’ Committee on New Music. He has collaborated with composers George Katehis and Hon Ki Cheung in the premiere of their organ works for the 2014/15 and 2015/16 American Guild of Organists’ Student Commissioning Project. In 2017, he was awarded a substantial grant from the Arizona Center for Renaissance and Medieval Studies for a project titled “Crossroads for the Organ in the Twenty-First Century: A Precedent for Secularism in the First Decades of Sixteenth-Century Print Culture.” In the Spring of 2016, Alexander was a finalist in the Poister Competition and won second prize at the Westchester University Organ Competition. Alexander completed a Master of Music degree in Organ Performance and Music Theory at the University of Kansas where he studied organ with Michael Bauer and James Higdon. He earned a Bachelor of Music in Organ Performance from Syracuse University where he worked with Kola Owolabi. Concert organisé en coopération avec le Festival International d'Orgue de Pékin. This concert is organized in cooperation with The Beiijing Organ International Festival.